We could not have spent the summer holidays anywhere else other than the Highlands of Scotland. We have been outdoors every day for nearly 6 weeks, breathing in to fill our lungs with the purest of air whilst introducing the children to so many new activities, traditions and historical events. The children have had the time of their lives exploring woodland and pastureland, swimming in lochs and taking in the powerful sound of 8 pipe bands marching alongside them. A bias towards Scotland is evident in the family’s desire to buy Muckrach Country House Hotel, near Grantown on Spey, but I have said so many times and will keep on saying that I cannot believe how much more I have discovered to enjoy here in the Cairngorm National Park. A broken record I may have become, but if you haven’t tried it on your Scottish Highland holidays please add it to your bucket list, I defy anyone to be unable to find their reason to be in the Highlands. If all else fails, may I suggest that a stay at Muckrach will be at least one of those reasons to be in the Cairngorms, where you’ll be looked after by lovely people in comfort, surrounded by the natural beauty of the landscape? Summer holidays are so precious where families make opportunities to spend quality time together, removing the stresses and strains of routine in day to day life, the chance to really look at each other as a family and appreciate the fun and bond that your unit is all about. It didn’t take me long to realise that I had been given a golden opportunity to stay in Scotland to learn more about life in the Highlands, the events that draw so many people to the area every summer and meet more of the people that make the Cairngorm National Park so special. The decision to migrate north for the summer holidays was made in seconds, our children (age 4 and 2) adore life up here, the freedom to explore and learn more makes them thrive and I could continue to embrace the community of the Cairngorms and document the redevelopment of Muckrach. So we packed the car to the brim, drove 385 miles to the Highlands and rooted ourselves here for the whole of the summer holidays and here’s our summer story. Scottish Highland holidays versus the Costa del Sol was all we commented in the first 10 days of our arrival, as we experienced 30 degree, sun-filled and blue-skied days with friends. The children swam in lochs and pools, rowed boats on Loch Morlich, dug in the sandy beaches of Loch Morlich and Nairn, danced in the gardens of Scottish Castles, picnicked in the grounds of Muckrach, by the sea, by lochs and in the mountains. Everyday the children wore their swimwear and had water fights laughing at the fun and freedom of the school holidays. Ewan and Ella’s friends went home and the weather cooled, so no more swimming in lochs but everything else was possible. 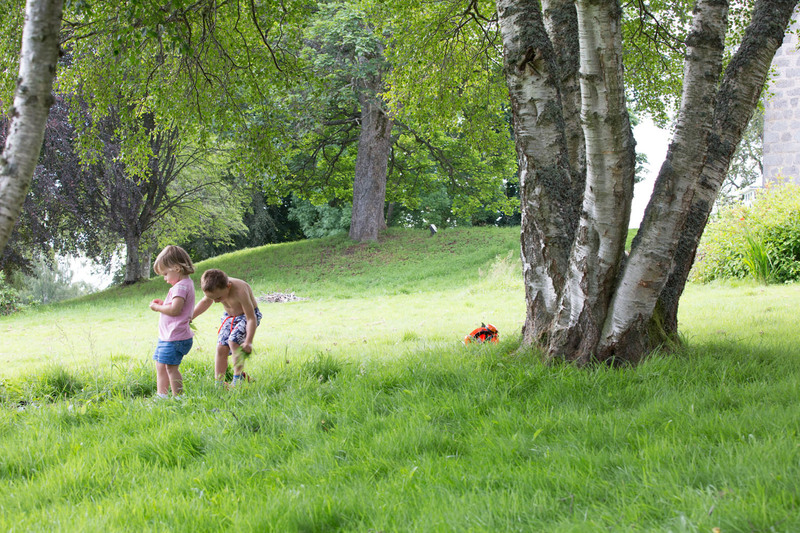 They have continued to dance and roll down the hills of Cawdor Castle, a beautiful castle near to Nairn that has stunning gardens and lots of grassed hills that are perfect to roll down! The bike trails around the Cairngorm National Park are brilliant regardless of your ability, for us the family trails of Rothiemurchus are perfect, enough hills to work up an appetite, enjoy whizzing down the hills and the scenery is stunning. Ewan enjoys his new ‘big boy’ bike now he is riding independently and Ella loves the thrill of the toddler trailer on the back of my bike, there are many places to hire bikes around the area, we have had great experiences with Mike’s Bikes. During the summer, the holidaymakers flock to the traditional events held all over the Highlands that take advantage of the better weather and the tourist numbers. 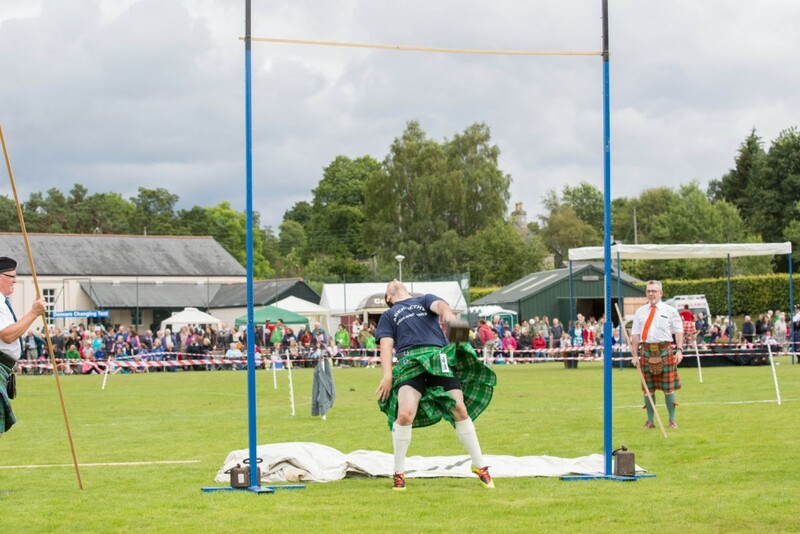 In particular, the Scottish Highland Games are held every Saturday throughout July and August, of which there are 60! Scotland has a long tradition and history of Highland Games where Clans would compete against each other in sporting events. Many events at the Highland Games nowadays still use items that would have been part of everyday life in the Highlands of old. Tossing the caber, throwing the Scot’s hammer and the shot putt combined with the power of the pipers and drums parading makes the Highland Games a dramatic and memorable experience. The best day of the summer Scottish Highland holidays for me was enchanting, breath-taking and amusing, a day that passed in a flash and left me wanting more! 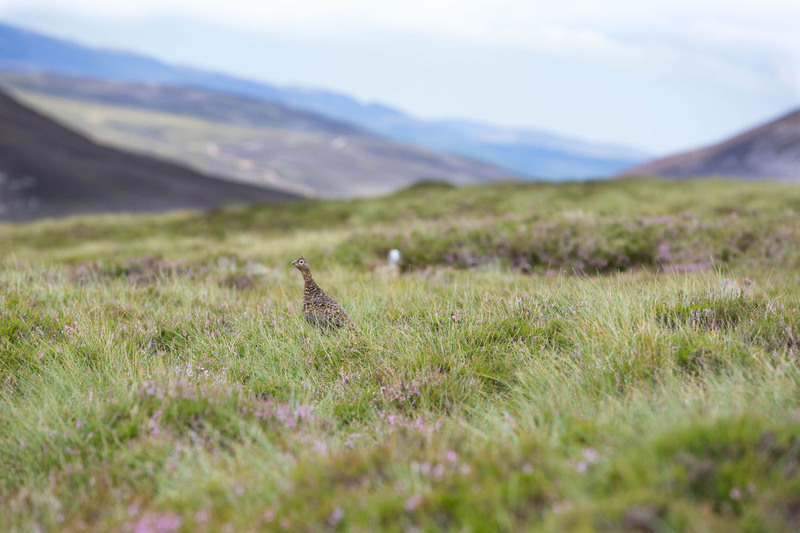 I was lucky enough to be invited to a day on a Scottish estate with Gamekeeper Colin and Photographer Mary of Hemsworth Images, both full of fun and so much knowledge in their professional field. I was in my element, I love photography and fed off Mary’s professional knowledge, the scenery was amazing and Colin offered so much information about the flora, fauna and wildlife around us, what more could I ask for? We travelled to Kincraig to the Dunachton estate, over 10,000 acres of the Highlands with grouse moorland filled with the purple haze of the heather, mountains, rivers and bothies. By 4×4 we drove along tracks on the mountainside, across rivers and over rocks to reach some of the most beautiful spots I have ever experienced. The grouse popped their heads out of the heather, the deer turned their antlers to look as they heard us creep up on them (on all 4’s! ), a golden eagle even took flight nearby and the clouds floated in and out of the blue skies. 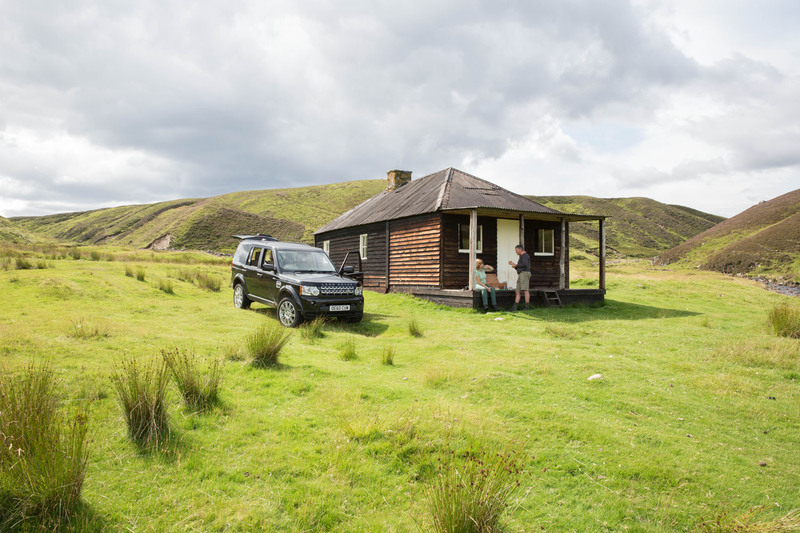 We stopped for a picnic at the Felaighn Bothy set in the basin of the mountain range next to the river, Colin and Mary opened up the wicker basket and out came fabulous food and flasks of tea, everything tasted amazing in this perfect setting. 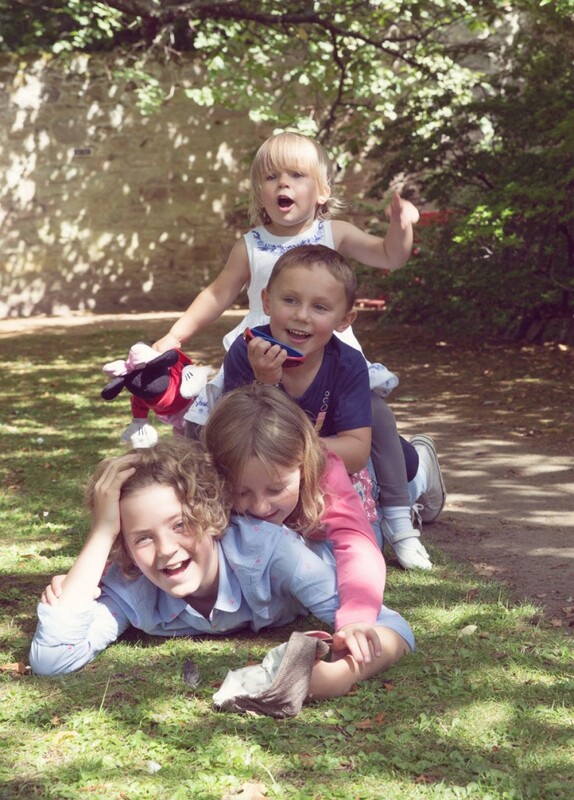 The looming routine is upon us as we reach the end of the summer holidays, but the fun, the fresh air and the fabulous memories will keep us going until the October half term. We’ll be back, we can’t resist the magic of the Highlands and the beauty of the hills as rutting season is in full swing, the mountains change from late summer purple to a haze of orange and brown and the lochs reflect the orange and yellow of the trees surrounding them.